This Irish Santa decoration has a list with the names of all the good little boys and girls. This Irish Santa figurine is named Celtic Christmas and he features shamrock decorated gifts along with his list of good little boys and girls. The Irish Santa is further enhanced with a green and white suit that includes a gold shamrock on his hat. 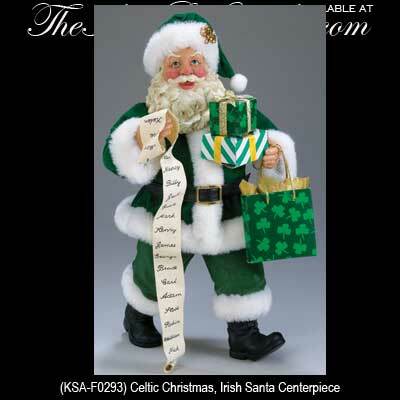 The Celtic St. Nick stands 10" tall and is made of porcelain and Fabriché by KSA. The Irish Santa decoration is gift boxed with a shamrock history card that is complements of The Irish Gift House.